This afternoon at Comic-Con, Christopher Nolan and Matthew McConaughey dropped an exclusive look at a new trailer for their mysterious new film Interstellar. Some of the footage was the same as the UK trailer, below. But here's what was new: we got a look at the destination for McConaughey's Cooper and Anne Hathaway. We see them outside the ship in their space suits, and the light is very blue. Then they're on a rocky planet, still in their suits, struggling in some kind of body of water. They're also assaulted by what looks like some kind of X-shaped object, which barrels towards them like a missile or a ship. It doesn't look natural, so we'll see what that means. The new trailer starts with Michael Cain saying that the only way we can solve whatever is wrong with Earth is by leaving. McConaughey tells his children that he has to go, and his daughter asks "how long?" The young girl bears a striking resemblance to Jessica Chastain, by the way, who appears later — we see her face on screen in the spaceship, while a sad-looking McConaughey stares at her. He and Hathaway have a conversation about how he didn't tell her what he was doing because he didn't know how to explain it. We also see some tender moments between Hathaway and another member of the crew. During the discussion, McConaughey described his character Cooper as "Pilot, engineer, widowed father of two children." He's offered a chance to his dream of interstellar flight happen, but has to leave his two kids. Nolan added, "It's really about human beings, about what it is to be human." He said that he discovered what other filmmakers have, too: That the further you travel out in the universe, the more it becomes about the human condition. Nolan was asked why he was so interested in psychology. He said that he doesn't do it consciously, but that "I'm just very interested in people, and in objective versus subjective." 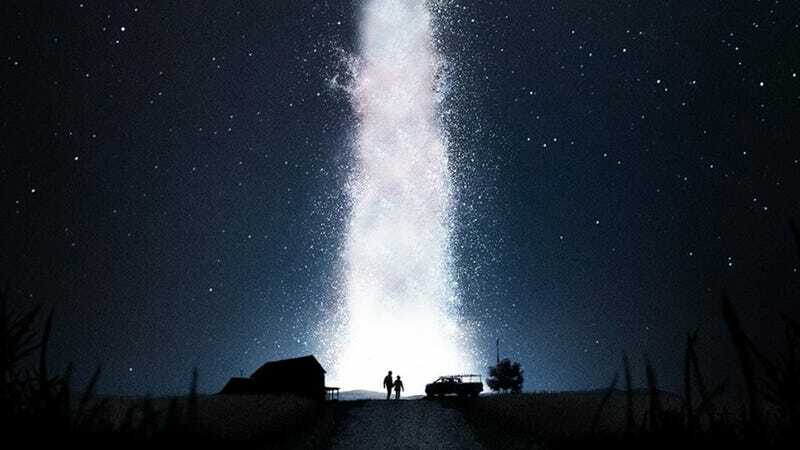 Objective reality vs. subjective reality will clearly be big themes of Interstellar, much like they were in Inception. [You'll see we're] trying to show the biggest possible images and bigggest posssible imaginable phenomena ... [But my] ambition is not to do what they did because I don't think anyone could, but a similar scope and scale. He also promised lots of homages, saying "You'll see all the things I've ripped off. I'm not joking when I say that." Now you can watch the entire panel if you want! Here's a nice video of it from the folks at Movieguide.